A new air route connecting Lijiang, Guilin and Ningbo, launched by Capital Airlines, is scheduled to open from November 1, 2013, according to Guilin Liangjiang International Airport. The Lijiang-Guilin-Ningbo flight is set to make a round trip among these three cities in a single day. An A319 aircraft will take off from Lijiang at 9:50 am, every Monday, Wednesday and Friday. There will be three flights a week on the route operated with the flight number of JD5537/5538. The flight starts from Lijiang at 9:50 a.m., and arrives in Guilin at 11:40 a.m.; while the return flight takes off from Guilin at 16:50 p.m. the same day, and arrives in Lijiang at 19:00 p.m. A one-way trip will take one hour and 40 minutes, and will cost about 1,550 yuan ($254.2) for a full-fare ticket. 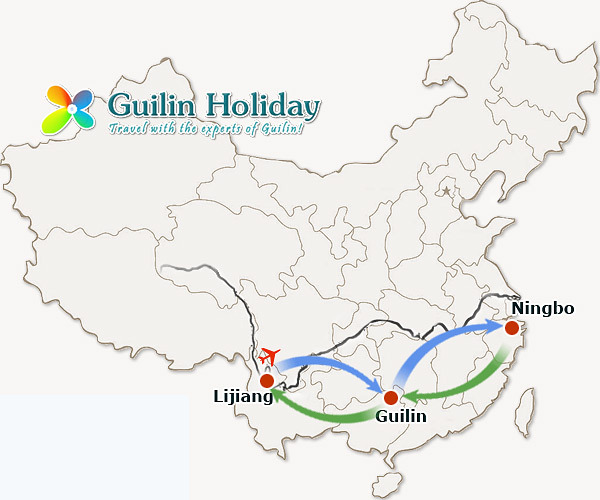 The flight from Guilin to Ningbo departs at 12:05 p.m, and the flight back from Ningbo to Guilin departs at 14:50 p.m. This one-way trip will take two hours and a full-fare ticket will cost about 1,060 yuan($173.9). Impressively, with the launch of new air route, direct regular flight connecting the two popular tourist cities - Guilin and Lijiang - has officially been set up. In the past, there was no non-stop flight from Lijiang to Guilin, even no direct train and long-distance bus. Visitors had to go to Kunming first, and then transfer to Guilin. Both Guilin and Lijiang are world-renown tourist destinations with beautiful landscape and colorful ethnic culture. The developed coastal city of Ningbo in east China will bring a large number of tourists to Guilin and Lijiang. The new air route will greatly shorten the travel time between the three cities. It is expected to promote the tourism, cultural and economic exchanges.